We are home from hsopital now. Thank goodness for that. Hospitals are noisy, busy places. I do not believe that any one ever goes there for rest and recovery!! Philip is doing well. We left the hospital with a bucket full of medications (I am not even close to joking…). My Pete and I have to keep a list of what we give him and when so that we don’t confuse ourselves. They are all working together to provide him with pain relief. He is still tired, but that is to be expected. He lost two kilograms in hospital. He is as skinny as a stick. I gained four kilos to make up for it by eating from the chip and chocolate machine just beside his room. We are looking forward to the plane trip home in a couple of days. Me, because I want to be in my own house. My Pete, because he wants to potter about and do stuff – rather than sit in one place. Pip, because he desperately wants to set off the metal detectors and tell security that he has a metal bar through his chest wall. He shouldn’t gloat though… aeroport security might not take kindly to that! Today all tubes and medical equipment (including the machine that goes ping) were removed from my son. Getting rid of the epidural has allowed his blood pressure to stablise and he is no longer turning pale whenever he moves. I feel much better about this. The physiotherapist has him up and walking, he is doing laps of the ward with the other old men in cardio-vascular. He is able to stand himself up, sit himself down and walk without any problem at all. He is still having difficulty getting from laying down to sitting up, but that will come. He is not eating terribly much, but has sent me on a quest to find him some chocolate milk, the sustenance of every thirteen year old boy! Philip Petersen has a metal bar in his chest wall. This may set off metal detectors. We have to take it with us when we go through security at the aeroport. He’s being a smart-arse again. He’s on the mend. I slept much better last night and am feeling far more sane too. The end is in sight. Thanks for all of your support. I’m sorry that I haven’t had the time to respond to all of you. You are all treasures! I am tired of a bed that is so hard it hurts my shoulders. I am tired of eating lean cuisine at 10pm in said hard bed. I am tired of shopping at the quickee mart. I am tired of seeking a laundromat to wash our clothes. I am tired of walking back and forth up the hill to the hospital with people who have squeaky shoes and forget the keep left rule. I am tired of eating crappy food because it is easier than trying to find something decent. MOST OF ALL, I am tired of being so damned far away from my people. EVEN more than that, I am tired of watching my son lose all the colour in his face every time he’s asked to do something. He is very compliant. He will swing his legs to the edge of the bed, take a deep breath, stand himself up, take bigger steps, lift his legs, lower his legs, blow in the tube and have a needle. He will do it all without complaint, but it hurts him and it exhausts him. I just sit and watch. I am tired of feeling useless. Yesterday Philip was able to move from intensive care to the ward. This was earlier than expected, but he was doing so very well. The scenario, as always, is baby steps and last night he had a fever and so took a small step back. Nothing of great concern, but we were so thrilled with his recovery so far that we had lulled ourselves into thinking that it would be a breeze. Every one of these statements is a question that he has asked. The staff has been so patient in responding to everything. He is using medical jargon like a pro. The surgery is over and went really well. The doctor is delighted with the results and his chest looks amazing – completely different (like a real boy’s). We had to buy a mirror so Philip could see his new body. He is feeling no pain at all. (Incredibly, seeing he just had eight ribs effectively broken!) The epidural is doing its work. He has just drifted in and out of sleep today as his body recovers. He is in intensive care and will remain there for the next few days. This is a good thing. He is getting lots of attention. We saw the post-surgery x-ray and were astounded. One doctor listened to his chest and said that he could hear no evidence of a heart murmur. This information alone gives us enormous peace of mind and confirms to us that we made the correct decision. Ashleigh made it safely to Paris. It took 37 hours. When she spoke to us she sounded small and exhausted. Her body clock will be way out of synch and no doubt take a few weeks to sort itself out. She better hurry up though, because we want to see a photo of the house where she is staying. As we all know…it’s all about what we want! There is a story behind the name of her blog. I bought a learn to speak French CD and ‘le guide est tres gentil’ is one of the phrases. It means that the guide is very nice. I tried to impress a French exchange student with the phrase, telling her that I would use it when I went to France. She looked at me with a deadpan face and said, “Yeah… I don’t think you’re going to need that.” CUT DOWN, by a seventeen year old exchange student! Apart from that I may blog sporadically over the next couple of weeks. I thank all of you for your generosity, kindness and gentle good humour. You are an amazing bunch of bloggers, so I’ll leave a song for you. Just purse your lips and whistle that’s the thing…. Today it occurred to me that my son generally sleeps in a singlet. Perhaps he should have a button up pyjama shirt if he is having chest surgery. Off I went to a major shopping centre. I visited five different shops, but there were no button up pyjamas for boys to be found! Eventually I visited a chain store of men’s clothes. 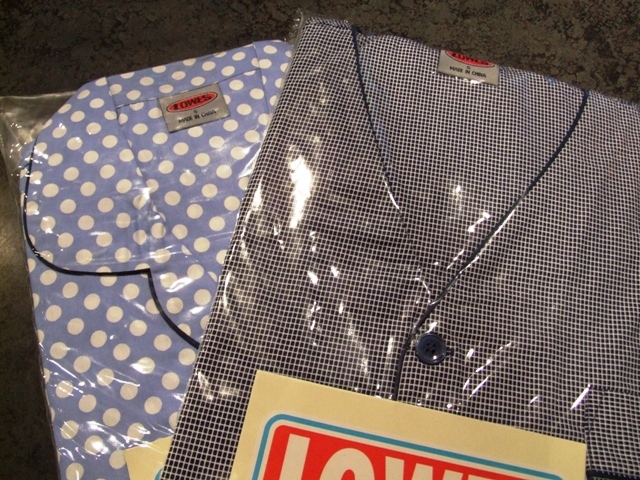 In the whole massive, overstocked shop they had just two pairs of small men’s button up pyjamas.